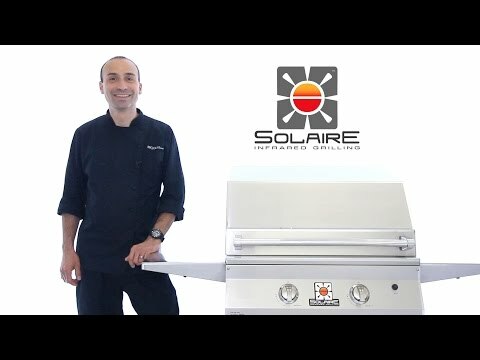 This Solaire All Convection Gas Grill On Post features commercial 304 grade, 18 gauge stainless steel construction with heli-arc welded seams, hand-polished mirror finish, and no mechanical fasteners; top-supported, self-trimming design; stay cool double skin hood; full-width stainless steel knurled tubular handle; two stainless steel convection burners for a total of 55,000 BTUs; 703 sq inches of cooking surface (455 sq inches of main grilling area); stainless steel V-shaped grilling grates that catch drippings to enhance flavor and reduce flare ups; removable stainless steel warming rack and drip tray; and pushbutton rapid-start ignition. Burners are easily removable for cleaning. Includes Solaires in-ground post. Solaire have a limited lifetime warranty on stainless steel construction, main burners and V-grilling grids. Includes standard grill cover. Limited use of the grill so far due to bad winter weather here but performance has been great. Shoppers Choice customer service has been exceptionally good (5 stars). They quickly corrected a missing piece (grill cover) and gave me instructions on how to apply for free steaks as advertised by Solaire which I submitted to Solaire as instructed. But after waiting the last 10 weeks, no steaks and no communication from Solaire. They make a very nice grill but customer service is not so good. 25 3/4 X 17 7/8" 25 3/4 X 17 7/8" 25 1/2 X 17" 24 X 18"